A composition is a set of linked numerical models that exchange information as they run. In this way a model of coastal erosion in one area can pass information on the volumes of sediment that leave it onto the next model in time for it to influence the behaviour observed in the second model. For the coast from Formby Point to Blackpool, we have developed a composition that links the following models: UnaLinea, ASMITA and POLCOMS (Sutherland et al., 2015a; 2015b). These three models were chosen as they represented the landforms and landform complexes identified by the Coastal and Estuarine System Mapping. This is a visual approach that was presented to stakeholders to get their opinions and to seek a consensus view on the landforms and key interactions on this coastline. This is therefore a participatory approach, which could be applied also to the selection of models and linkages in a composition. 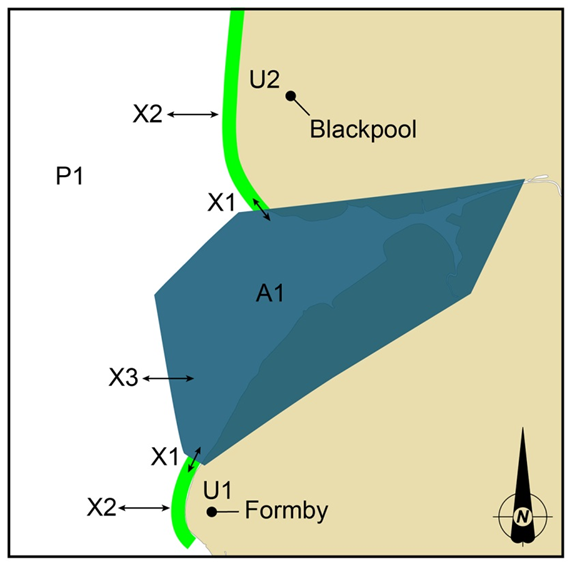 The model instances are shown in Figure 2 and consist of a UnaLinea model of Formby Point to Southport (U1) an ASMITA model of the Ribble estuary (A1) a UnaLinea model of the Blackpool/Fylde frontage (U2) and model results from the 2008 POLCOMS simulation (P1) of Liverpool Bay (Brown et al, 2015). Details of models are provided in the following section. Model linkages are also shown in Figure 1 and consist of UnaLinea - ASMITA bi-directional links (X1), POLCOMS - UnaLinea links (X2) which are uni-directional and POLCOMS - ASMITA link (X3) which are uni-directional. Details of model linkages are also described below in Figure 2. Before using the Liverpool Bay Composition model please read the setup instructions located here. The zip file also contains model input/output files and results. Brown, J., Amoudry, L.O., Souza, A.J. (2015b). "Residual circulation modelling at the national UK scale to identify possible sediment pathways to inform decadal coastal geomorphic evolution models." Proceedings Coastal Sediments '15.